An indictment filed with the U.S. District Court for the Northern District of California on July 12 allege Zhang stole a 25-page detailed schematic of a circuit board designed for use in an autonomous vehicle. The former Apple engineer was initially appointed a public defender, but was represented by a personal lawyer at a hearing on Monday, Reuters reports. Zhang's alleged indiscretions were detailed last week in a court filing from a Federal Bureau of Investigation agent. The engineer was a member of Apple's "Project Titan" Compute Team, responsible for designing and testing circuit boards that analyze data from various vehicle sensors. 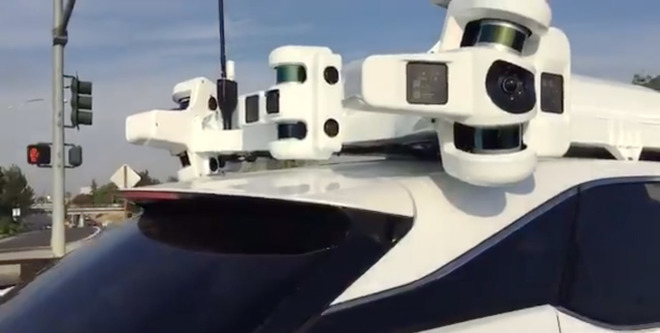 As such parts are a critical component in an autonomous vehicle's infrastructure, Zhang was granted wide access to databases containing trade secrets and sensitive intellectual property. Zhang made preparations to depart from Apple earlier this year while on paternity leave. During a meeting with management, Zhang said he intended to move to Guangzhou to tend to his ill mother and would take a position at Chinese electric car startup XMotors. When the engineer handed over his company-issued laptop and iPhones, Apple's security team discovered unusual download activity that included access to confidential files. Security camera and security badge swipe data also placed Zhang in Apple labs during his leave, an action in violation of company policy. When questioned, Zhang initially denied the allegations, but later admitted to taking two circuit boards and a linux server. He also admitted to AirDropping files from company computers to a personal laptop owned by his wife. If found guilty, the former Apple engineer could face ten years in prison and a $250,000 fine.